A skilled researcher will generate a recommendation that clearly states the objectives (what you want to learn), the methodology (the research tool to be used), and the deliverables. Also, use a professional recruitment facility. In many cases, they will have a database of candidates that can be rescreened for their desirability or will have creative ways to attract potential participants. Take the time to educate the moderator on the subject matter. The moderator needs to understand the topic in order to engage conversation to an appropriate level. Try to anticipate what questions may arise and brief the moderator. The moderator should draft the discussion guide that will be used. When reviewing the discussion guide draft, take the time to reiterate what are more important topics versus the unimportant. It is far preferred to make adjustments at this approval stage than in the middle of a group when new thoughts break the flow of conversation. Keep in mind that the discussion points are conversation starters that the moderator carefully interjects when appropriate. This is not a question and answer session, but an exploratory, organic discussion. The guide outlines the topics that should be covered, but the moderator should be able to explore topics as they flow in the conversation as well as other ideas that are brought up, as long as they are relevant. Oftentimes, great ideas are generated that were not part of the original discussion plan. Give the moderator adequate time and flexibility to discuss these topics. Use a skilled, independent moderator. You are paying to gain an understanding of each participant’s experiences and one of the many roles of the moderator is to create an environment of openness and trust. The moderator gets the conversation going, but should let the participants speak as much as possible and show no partiality (nearly impossible to do when the moderator represents the research sponsor). He or she should be adept at engaging each participant and not allowing any one person to “take over” the conversation. Attend and observe. It can be difficult to distill conversations between multiple people, and watching video or audio clips is tedious at best. The best groups are ones in which he client takes an active interest, and can, if desired at one appointed time, ask the moderator to explore or refer back to something brought up in real time. It demonstrates the importance placed on the study, and one can get much more from the experience by viewing first-hand. Use of panels provides an expedient way to recruit, but don’t fall trap to the professional participant. Consider incorporating a few carefully screened new participants along with the panel. Qualitative is not Quantitative – Focus group findings are directional, and because each group is comprised of 8-10 persons, they are not projectable across the population. I have been asked in the past to tally percentages of who said what in concept testing research. This is mixing qualitative and quantitative methods. Many times, the best recap is to hold a debrief meeting where the moderator can discuss insight in collaboration with the client viewers. A brief summary identifying ideas with perhaps some quotes is a recommended summary report model. 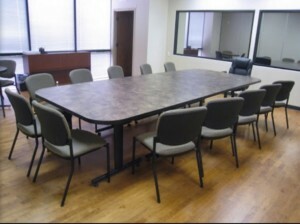 Focus group room with 1-way mirror, seating 10-12 participants. Courtesy: AOC Research.